Meanwhile, in 10-inch skillet, cook ground beef over medium-high heat, stirring frequently, until beef is thoroughly cooked; drain. Stir in taco seasoning mix and water. Reduce heat to medium; cook uncovered about 5 minutes, stirring frequently, until water has evaporated. Remove from heat. Spoon beef mixture into heated taco shells. Top with cheese, lettuce and tomato. Spoon sour cream into small resealable food-storage plastic bag. Seal bag; cut tiny hole in corner of bag. Pipe sour cream over top of each taco to resemble spiderweb. 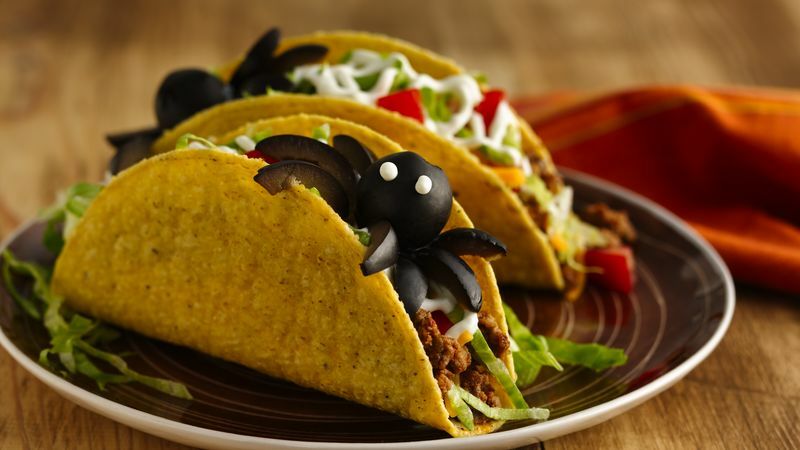 For each spider, top taco with 1 olive, pitted end down. Cut second olive lengthwise into 8 pieces; place around olive for legs. For eyes, squeeze 2 dots of sour cream onto top of olive.